Thanks to the extended season for Tahoe ski resorts, The Landing has appealing lodging options for the remainder of the season. To make it easier for skiers and snowboarders to access this extended season, The Landing Lake Tahoe Resort & Spa, A Destination Hotel, announced a special “Extend Your Season, On Us” offer. For guests who book two nights, they will receive a third night free with this special promotion. The Landing Lake Tahoe Resort & Spa is located less than a mile from the slopes of Heavenly Mountain Ski Resort and close to the Gondola, which is conveniently situated at the Heavenly Village. Rates at The Landing start at $199 per night for the “Extend Your Season, On Us” offer. At 30-percent off, this special offer gives skiers and snowboarders Lake Tahoe another reason to make some end-of-season turns. To book this special offer or for more information, call 855 700-5263 or visit www.thelandingtahoe.com. The Landing Lake Tahoe Resort & Spa is a destination hotel in South Lake Tahoe, 4104 Lake Tahoe Blvd. The property is located less than a mile from the slopes of Heavenly Mountain Ski Resort and close to the Gondola, which is conveniently located at the Heavenly Village. Heavenly Mountain’s recently announced that the 2018-19 season includes the last three weekends in May: May 10-12, May 17-19 and concluding the season with an even longer weekend of skiing and snowboarding Lake Tahoe on May 24-27. The final four days is Memorial Day weekend. The Landing features a contemporary ski chalet design with views of either Lake Tahoe or the surrounding Sierra mountains from every room. The 77-room boutique property offers stone fireplaces, private outdoor decks and heated marble bathroom floors. After a day of play in the mountains, guests can relax in “The Spa” at The Landing, which features four treatment rooms and a full-service menu that is inspired by its mountain setting. The Landing also has fine dining. 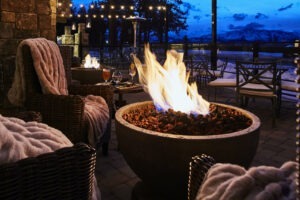 Jimmy’s, the resort’s signature restaurant, features wood-fired regional California cuisine paired with arguably the most diverse wine collection in the Tahoe basin. The restaurant’s intimate setting offers several private dining alcoves that offer stunning views of Lake Tahoe. There are five outdoor firepits for creating s’mores, enjoying an after-dinner drink or simply taking in the views. The resort is not just appropriate for ski season. It provides the perfect year-round setting to enjoy all the Lake Tahoe region has to offer. The property is situated across the street from a private beach for summer fun.